This page covers advantages and disadvantages of UTP. It mentions UTP advantages or benefits and UTP disadvantages or drawbacks. UTP stands for Unshielded Twisted Pair. ➨It is smaller in size. Hence installation is easier as it does not fill up wiring ducts. ➨It is less expensive compare to other networking media types. ➨It is thin and flexible which further makes installation easier. ➨UTP cables are used in most of the networking architecture. ➨It is designed to counter EMI, RFI and crosstalk. ➨It is more susceptible to interference compare to most of the other cable types. Twisting of pair helps to certain extent but it does not make cable impervious to electrical noise completely. ➨It can be used up to cable segment lengths of about 100 meters only. ➨UTP cable should follow specifications for number of twists or braids permitted per meter of cable to reduce crosstalk. 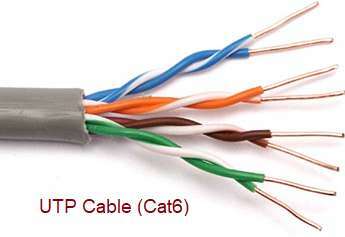 Also refer advantages and disadvantages of STP cable >>.